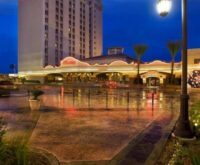 The closest hotel and casino to the Las Vegas Motor Speedway, the Lucky Club Hotel and Casino attracts racing fans from across the country when world-class racing comes to the track. Lucy’s Bar and Grill is the perfect spot to celebrate after the checkered flag drops. This Hotel features over 80 newly decorated rooms and suites, an outdoor pool and sundeck.